For the second time in as many elections, it’s looking like Keiko Fujimori will narrowly lose a runoff to become Peru’s president. With nearly 93% of the results counted, Fujimori was trailing behind economist Pedro Pablo Kuczynski, the 77-year-old former banker and International Monetary Fund official who served briefly as prime minister in the 2000s. 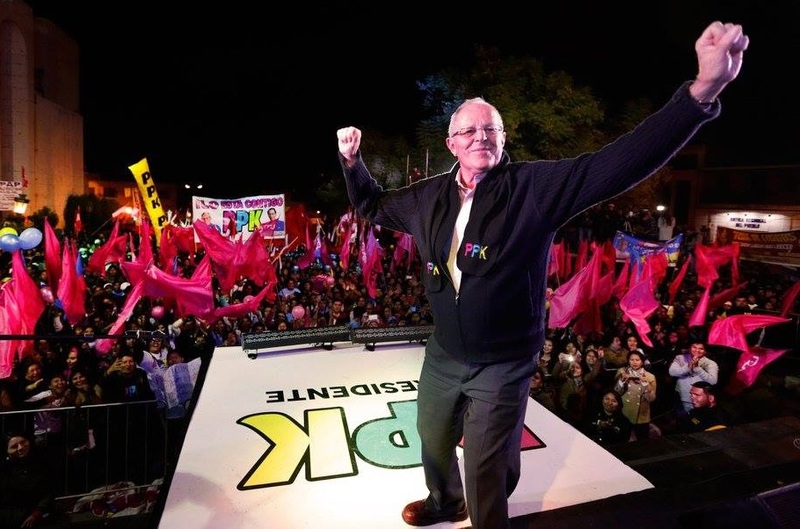 Kuczynski, widely known across Peru by his initials, ‘PPK,’ was winning 50.32% of the vote to just 49.68% for Fujimori. Though we do not know the exact results, and we might not know them until later today or this week, all signs point to a narrow victory for PPK, who placed third in the 2011 presidential election (behind Fujimori) and who trailed Fujimori by double digits in the initial April vote. Indeed, for years, the 2016 election seemed like it was Fujimori’s to lose. 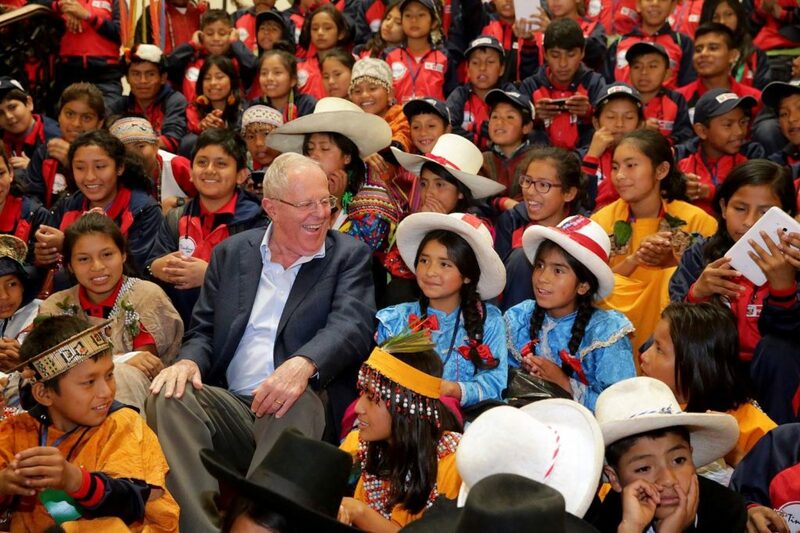 Kuczynski, an internationalist who seemed more at home in Washington, D.C. than in the Andean highlands, is not exactly a natural on the campaign trail. He took an incomprehensible break from the runoff campaign to visit New York (where he attended his daughter’s graducation, but where he also gave a speech to the Council on Foreign Relations, feeding the hype that he’s not ‘authentically’ Peruvian). For Pedro Pablo Kuczynski, the hardest part of Peru’s two-stage presidential election might be making it into June’s runoff. It was no surprise that Keiko Fujimori, the daughter of former president Alberto Fujimori, a controversial figure now serving a prison sentence for human rights abuses during his time in office from 1990 to 2000, would win the first round of the election on Sunday. Quick counts and initial results show that Fujimori, as predicted, easily won the first round with around 39.5% of the vote. 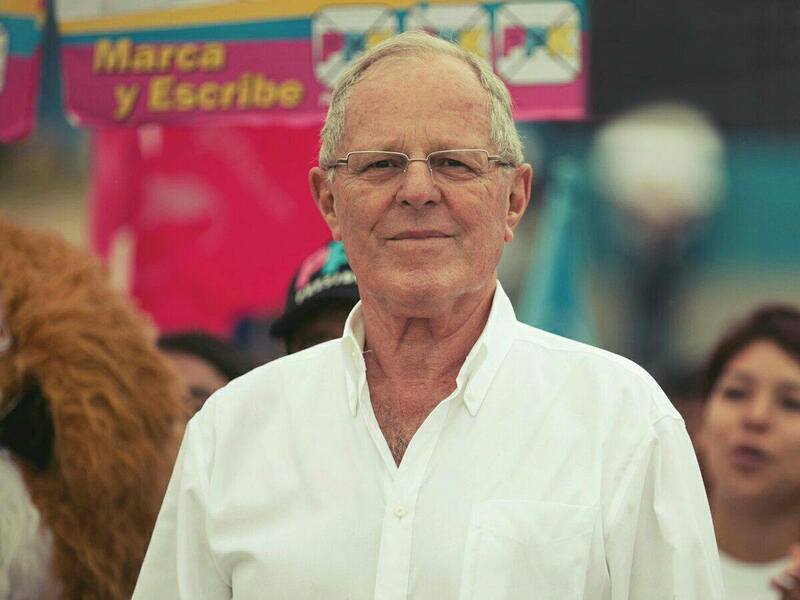 Kuczynski, nearly universally known as ‘PPK’ in Peru, was winning around 23.7% of the vote, enough to edge out the third-placed candidate, left-wing Verónika Mendoza, who was winning around 17.1% of the vote. The results all but assure that Kuczynski will emerge as Fujimori’s challenger in the June 5 runoff — a choice that many Peruvians wanted in the 2011 election. Five years ago, it was leftist Ollanta Humala who won the first round, while Fujimori placed second, eliminating Kuczynski from the runoff in what many voters considered a worst-case scenario. On one hand, they could support a former army officer with a spotty military record and with ties to the radical left; on the other hand, the daughter of an anti-democratic authoritarian. PPK’s apparent victory over Mendoza this year means that the 2016 runoff will be far less ideological than the 2011 runoff, instead featuring two candidates who espouse the kind of orthodox economic views that have dominated Peruvian governance since since the 1990s (even, perhaps surprisingly, during the Humala administration). One of the central policies of Keiko Fujimori’s campaign has been a promise to use some of Peru’s $8 billion ‘rainy-day’ fund to stimulate spending on infrastructure and other projects to develop rural Peru. That means she will, on economic matters at least, be running to the left of PPK, who has called for budget discipline and pro-business policies that include a modest sales tax cut. Both candidates have signaled that they want to curb Peru’s growing coca production, and both candidates want to work to give local communities a greater share of profits from gold and copper mining that have boosted the Peruvian economy. In 2011, Peruvian author Mario Vargas Llosa famously compared the choice his country’s electorate faced as a choice between AIDS and cancer. 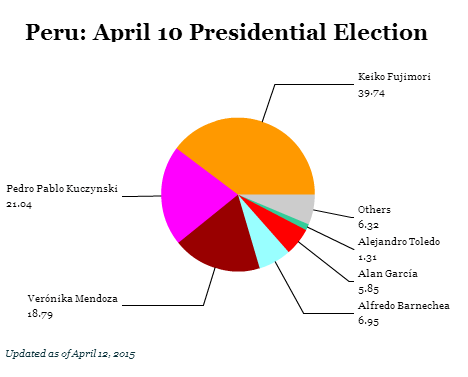 Five years later, one of those choices from that election, Keiko Fujimori, the daughter of Peru’s former authoritarian president (now serving in prison for corruption), now leads the country’s April 10 vote by double digits. Ollanta Humala, who defeated Fujimori five years ago, once feared as a militarist left-wing firebrand and a chavismo sympathizer, is leaving office widely derived and haunted by corruption, even after hewing to a middle-road path. Though Humala will step down with as poor of an approval rating as his most recent predecessors, the biggest surprise of his presidency is that he ultimately chose to follow a center-right, business-friendly path in line with the past two decades of Peruvian governance. Humala will leave office, to the dismay of his one-time left-wing supporters, as a defender of neoliberal economics who stood, often with the force of Peru’s military, against striking workers and miners across the country. 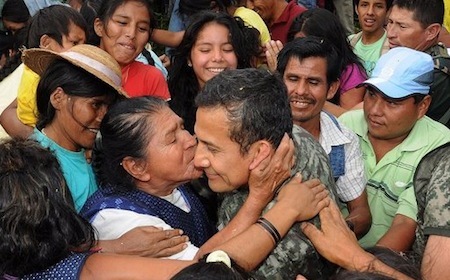 Though Humala himself is a former army officer, he failed to contain the growth of Sendero Luminoso (Shining Path), a Maoist guerrilla operation that’s made modest gains in southern Peru over Humala’s administration, despite its near eradication a generation ago. As of February, Humala has also been implicated in Brazil’s widening corruption inquiry, amid allegations from Brazilian police that Humala may have taken bribes from Odebrecht, a Brazilian construction firm. His wife, Nadine Heredia, who once harbored ambitions of succeeding Humala herself, is also under investigation for corruption. It’s no wonder that, once again, in an election year, Peruvians are looking for a change. Fujimori, for her part, has positioned herself well since the last election. The frontrunner to win Sunday’s presidential, she is nevertheless unlikely to secure the presidency outright. More likely, Fujimori will face the second-placed candidate in a June 5 runoff. Still, the prospect of an easy double-digit win for Fujimori spawned a wave of popular protest across the country this week, a sign of the tumult that might follow in the two-month runoff campaign as anti-Fujimori forces coalesce behind a single challenger. Nearly 30,000 flooded the streets of Lima, Peru’s capital, earlier this week in opposition to her candidacy. Protesters worry that a Fujimori victory (either now or in June) will restore the same authoritarianism and corruption that marked the decade of rule under her father, Alberto Fujimori, between 1990 and 2000. Despite Keiko’s best efforts, the June runoff is likely to become a referendum on her father’s legacy. It’s become a political law of gravity in Peru in the past 15 years that the popularity of its elected presidents drops as each five-year term ends. That’s irrelevant for the current president, Ollanta Humala, since Peruvian presidents aren’t eligible for reelection to two consecutive terms. 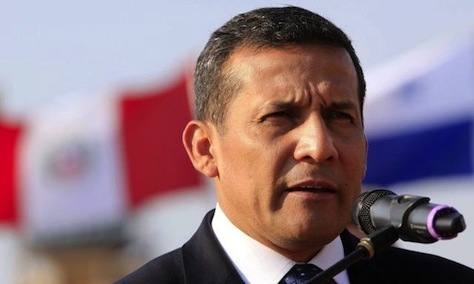 But a week after opposition parties in Peru’s Congreso de la República (Congress of the Republic) forced Humala’s prime minister Ana Jara to step down amid a internal spying scandal, Humala was obligated to appoint the seventh prime minister of his administration. Although the Peruvian president functions both as head of state and head of government, the prime minister heads the executive cabinet, and the appointment of Pedro Cateriano launched yet another reshuffle in the Humala administration as voters seem to be souring on Humala in the fourth of his five-year term. The Congress voted on March 30 to censure Jara in relation to allegations that Peru’s intelligence agency, the Dirección Nacional de Inteligencia (DINI), was spying on opposition politicians, journalists and businessmen. Despite fears during the 2011 election that Humala, a leftist and former army officer, would lead Peru in a populist direction in the manner of socialist governments in Ecuador, Cuba and Venezuela, Humala instead pursued the same liberal, pro-market economic policies of all Peruvian administrations since the 1990s. Nevertheless, as commodities prices drop, GDP growth projections are falling in a country where gold, zinc and copper mining undergirded some of the fastest economic growth in the world throughout the 2000s. It’s the same problem that Chile, Peru’s Pacific neighbor to the south and also a prolific copper exporter, is facing. The difference is that GDP per capita is just over twice as high in Chile as in Peru, a country of just over 31 million that is still struggling to rise to the same level of development as Chile, Mexico and other leaders in Latin America. Nevertheless, Humala failed earlier this year to implement even a watered-down labor market reform designed to make it easier for young graduates to find work. With growth forecasts slowing, however, it’s not enough that Humala has pursued continuity in economic policymaking. His failure to reform Peru’s economy, combined with an expected slowdown (if not an outright recession), will make it difficult for Humala’s allies to maintain power in 2016. In Peru, a country without firmly settled political parties, however, it’s a question whether Humala is still a man of the political left. Though liberal reformers believe Humala’s accomplishments are tepid, he’s now closer to Peruvian author Mario Vargas Llosa than the traditional left. For example, Humala has struggled throughout his administration to respond to the economic, labor rights and environmental complaints of Peru’s mining workers. Gana Perú (Peru Wins), the leftist electoral coalition that formed to support Humala’s candidacy in 2011, claims that it will still field a candidate in the upcoming 2016 vote. The party remains the largest bloc in the unicameral Congress, having won 47 out of 130 seats at the last election. That number, however, has fallen due to defections over the years. Humala’s wife, Nadine Heredia, was forced to disavow any presidential ambitions in the middle of her husband’s term, and any majestic hopes evaporated with fresh allegations in February of corruption and money laundering, a familiar refrain in a country where former president Alejandro Toledo is also under a cloud of suspicion for corruption and may yet face criminal charges. Humala’s popular former interior minister, Daniel Urresti, was forced to resign in February after his indictment for the murder of Hugo Bustios in 1988 when Urresti was involved in the fight against Senedero Luminoso (Shining Path). That means that the leaders in the 2016 field, for now, are the runners-up to Humala from the 2011 field. 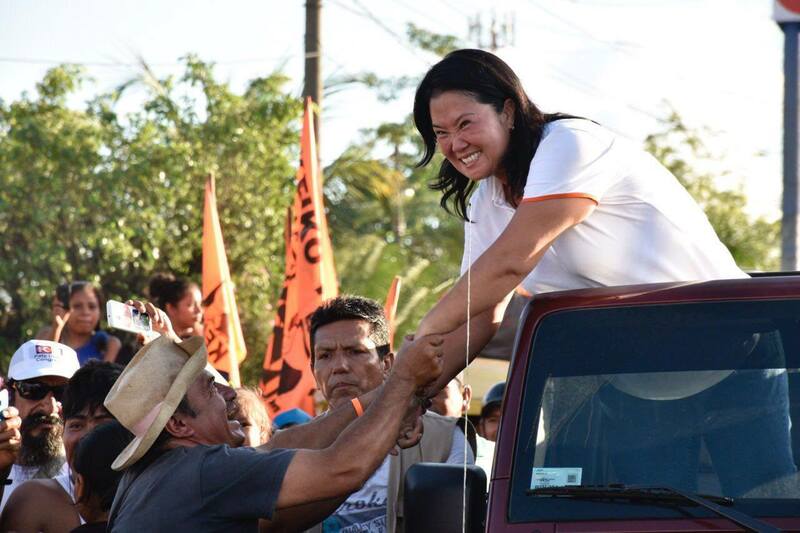 Polls today show that Keiko Fujimori, the daughter of former president Alberto Fujimori, leads the field, followed in second place by Pedro Pablo Kuczynski, a liberal who served as a former prime minister and economy minister. Fujimori’s candidacy was controversial in 2011 because of fears that she would pardon her father, who remains in prison on human rights abuses, potentially undermining the rule of law and encouraging impunity in the future. Humala has consistently refused to release Fujimori from prison, and the former dictator’s health has declined so much that the pardon issue may lack the same relevance in 2016. Proving the rule of the lingering unpopularity of Peruvian presidents, both Toledo and former president Alan García poll far behind. Fujimori’s record is still controversial in Peru, where supporters believe his economic reforms put Peru on the path to stable inflation and GDP growth and opponents point to his disrespect for democracy, the rule of law and human rights. His daughter, Keiko Fujimori, seems more committed to democratic Peru, though her frontrunner status in 2016 means that Peruvians could spend more time hand-wringing about the past than envisioning the future. One possibility is Luis Castañeda, who returned to the mayor’s office in Lima last October and who has already run for the Peruvian presidency twice. The pragmatism and pro-development agenda of his first two terms as mayor between 2003 and 2010, appealed to the Peruvian business community. So far, however, Castañeda has spent much of his third term seemingly engaged in settling scores with his immediate predecessor, the more leftist Susana Villarán, instead of establishing a platform for a third presidential campaign in 2016. Democracy, participation, and discontent: a crisis of governance for Peru? July 28 marked Peru’s day of national independence, the centerpiece of a series of celebrations collectively known as Fiestas Patrias. U.S. readers might imagine this extended holiday as a combination July 4, Thanksgiving, and Decoration Day (in its most tragic and most triumphant senses). It’s also the occasion for the sitting president to deliver a major policy address, more or less equivalent to the State of the Union. In this year’s speech, Peru’s president, Ollanta Humala, laid out an agenda which hit some nice notes, with the president focusing his attention on major themes of anti-corruption and social inclusion, with the latter to come both through social programs and through market-oriented growth. There were few real details, and accordingly some commentators castigated the president for failing to concretely attend to major issues, such as citizen security, which are on many Peruvians’ minds. Still, Humala is on message: in none of his vagueness did he depart from the key pieces of his overarching double-barreled agenda: pursuing economic growth while ensuring that no one is left behind. Not a bit of what he said in his address was unexpected. It is a move not uncharacteristic of a president who has rhetorically embraced themes of popular participation without delivering concrete measures to drive forward a participatory agenda. 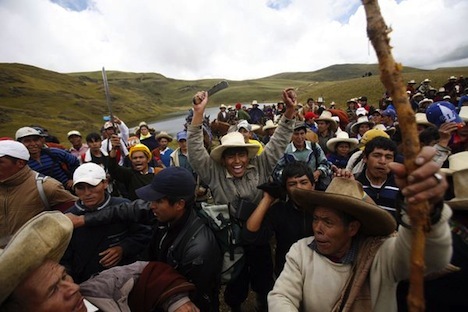 Even as Peru has seen an upsurge in in largely peaceful public demonstration, the Humala administration has asked demonstrators to ‘go home’; and even as municipalities have taken steps to push forward institutions of participatory democracy at the local level, the national administration stands accused of ignoring a pro-participation agenda at best, and of actively moving to neuter participatory institutions at worst. This is problematic not merely from the standpoint of democracy theory. Peru’s conventional institutional framework is troubled, with weak and fragmented political parties, an unpopular Congress, and one of the least-trusted judiciaries in Latin America. I n this situation, Peru’s framework of participatory institutions – various arrangements that invite citizens to actively engage with political processes in a realm beyond simply voting and returning home to await the next electoral cycle – offers the best hope for a revitalization of the political scene. But the Peruvian government has shown itself unprepared to take participatory institutions seriously. This is a shame, because an injection of participatory democracy offers a chance to avert a crisis of governance, by fostering active citizenship to channel popular participation, and burgeoning discontent, in productive directions. Is Peru’s Humala a modern-day Velasquista? It hardly seems like Ollanta Humala has been Perú’s president for two years — it feels like yesterday when we were assessing Humala’s first year in office. Official Lima, in so many manifestations, has always seethed with anxiety over these people, what they might do next (when it isn’t ignoring them). Humala’s big idea seems to be to resist the temptation to ignore the highlands, to push a broad economic integration into the national prosperity, satisfying the economic needs of those most likely to revolt – because it is in their nature, because they are sick of poverty, because to revolt is unfortunately at the moment justified, heck, pick a reason – before they revolt again. But with three years left to go in his presidential term, Humala remains in many ways a chimera whose once-leftist rhetoric has dissolved into a presidency that seems to have no prevailing ideology. That’s why it’s so tantalizing to look back to the Velasco years as a template for what Humala may yet try to accomplish — will he take up Velasco’s primary cause of pushing the fruits of Perú’s economic boom further down to the country’s poorest citizens? Perú is somewhat remarkable among Latin American countries in that party identification remains incredibly weak, there’s no strong center-left and center-right party as such, and leaders easily slip from left to right and back again. Humala’s predecessors, Alan García and Alejandro Toledo, both had their fair share of chameleonic moments in public life. What Jacob writes comes as close to articulating, in one sentence, Perú’s prevailing 21st century ideology as I’ve ever read, and it really applies to just about every government in recent Peruvian history, except perhaps two. The first is García’s first presidency from 1985 to 1990, which was a hyperinflationary socialist economic disaster. The second is the authoritarian presidency of Alberto Fujimori from 1990 to 2000, which began amid a low-grade civil war against the communist Sendero Luminoso (Shining Path). I find the comparison to Velasco particularly intriguing because it’s so rare that an army coup results in a leftist military-led government in Latin American history, and the similarities to Humala, the once-radical military man are simply too great to ignore. In 2000, Humala led a short-lived anti-corruption revolt from within the military against Fujimori. As it turns out, the revolt fizzled, Fujimori fled shortly thereafter and Humala was pardoned, but the similarities are hard to miss. In the 2006 presidential campaign, Humala often cited Velasco as a political touchstone and even went so far as to say that his administration would finish the work that Velasco’s started. Like Velasco and many before him, Humala is trapped between meeting the needs of a business elite that has kept GDP growth humming along (an elite that largely supported his opponent Keiko Fujimori in the June 2011 presidential race) and a restless majority still trapped in poverty (that largely placed its hopes in Humala). The Peruvian economy is likely to dip to just 6% growth this year — still high, but troubled by slack Chinese growth, flat prices for gold, copper, oil and other commodities that comprise over two-thirds — but protests over Humala’s performance in office continue, and polls show that his popularity has declined from over 50% earlier this year to just 33% this summer. What’s always been so interesting about chavismo is the way that the late Venezuelan president Hugo Chávez managed to build alliances both with just about every leader in Latin America, no matter how radical or moderate, while also building close alliances with a ‘who’s who’ of world rogue leaders on poor terms with the United States of America. It makes for an interesting set of photos from Chávez’s funeral — the photo above comes from the Facebook feed of Enrique Peña Nieto, the president of México, a country that’s had relatively little use for Venezuela over the past 14 years — former president Felipe Calderón used Chávez as a boogeyman in the 2006 Mexican presidential election to warn voters against the one-time leftist frontrunner, former Mexican City mayor Andrés Manuel López Obrador, and that may have made the difference in that election. Chávez died Tuesday in Caracas after a long fight with cancer, suddenly bringing to life Venezuelan politics that had largely been frozen in waiting on Chávez’s health since his 11-point reelection in October 2012. Peña Nieto was expected to move Mexican relations closer to Venezuela than under the more right-wing Calderón, but Peña Nieto and Chávez were hardly best friends. 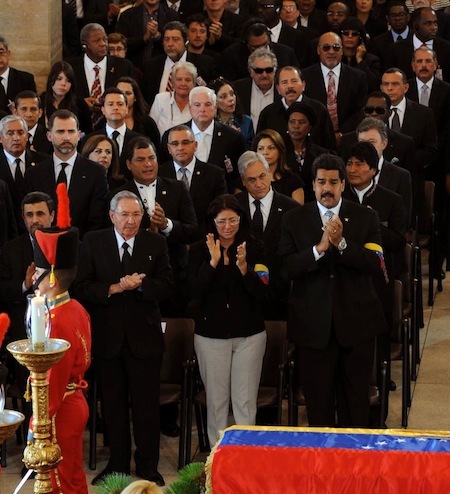 That relationship was part and parcel of the diverse set of relationships that Chávez had with the rest of Latin America — sometimes ally, sometimes foil, sometimes donor and often, all three simultaneously. Those relationships, all of which are on display this week in Caracas, give us a rough sense of whether chavismo — and the broader form of the populist, socialist left that has been on the rise in Latin America (though not necessarily in its largest, most economically successful, countries like México and Brazil) — will live beyond Chávez. Peña Nieto is in the fourth row, standing between businessman Ricardo Martinelli, Panama’s conservative president to his left and Peruvian president Ollanta Humala to his right. Humala, who won a very close election in 2011 in Perú, was feared as a potential chavista radical leftist, anathema to Peru’s business elite, despite renouncing a chavista-style government in Perú. In fact, Humala has turned out to govern as a business-friendly moderate, garnering relatively more criticism from environmentalists and social activists on the left since his election. July 28 marked the one-year anniversary of Ollanta Humala (pictured above) as Perú’s new president — and it was marked by the appointment of Humala’s third prime minister since taking office. The fear that many Peruvians had about Humala’s administration turned out to be a non-issue — whereas many Peruvians once feared that Humala would disrupt a decade-plus of staggering economic growth by turning Perú toward charisma nationalism. Although the Peruvian economy keeps chugging along, however, social unrest has turned out to be a thornier problem for Humala. The 2011 presidential campaign ended in a runoff between the two most polarizing candidates among five plausible presidents: the leftist Humala, the 2006 runner-up and a former Army officer, and Keiko Fujimori, the daughter of Alberto Fujimori, Perú’s president in the 1990s. Mario Vargas Llosa, the Peruvian Nobel laureate, famously compared the choice as being akin to terminal cancer and AIDS — despite reservations about Humala, Peruvians also worried that Fujimori would pardon her father, currently in prison for committing embezzlement and for committing human rights abuses during his time in office, unleashing demons from an era that many Peruvians would rather not revisit. When Humala won by a 3% margin, however, he moved quickly to assure Peruvians that he wouldn’t disrupt the booming economy, promptly appointing as his finance minister Luis Miguel Castilla, a deputy finance minister from the previous administration of Alan García. Far from nationalizing Peruvian industry, Humala has essentially left economic policy unchanged from his predecessors of the past decade. Félix Jiménez, Humala’s top campaign economic adviser, who briefly served as a presidential economic adviser, left Humala’s government in January 2012, and has since criticized Humala for being too beholden to orthodox economic policy and Peruvian economic elites. Another former adviser, Oscar Dancourt, a former acting Central Bank president, also left the administration. Those resignations were also, in part, a response to a December reshuffle that brought Oscar Valdés — an army officer and former military colleague of Humala’s — to power as prime minister. His appointment caused several prominent leaders, including former president Alejandro Toledo, to decry the growing militarization of the Humala administration. Valdés’s resignation last week, and his replacement by Peruvian justice and human rights minister Juan Jiménez, seems calibrated to adjust to many of those criticisms, which are tied to some of Humala’s biggest problems. 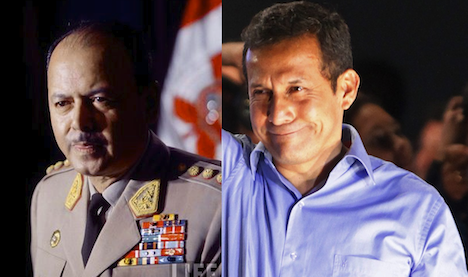 Jiménez had increasingly become a key troubleshooter for Humala, especially in contrast to the increasingly unpopular Valdés.